The figures are in the latest Medical Council annual report. 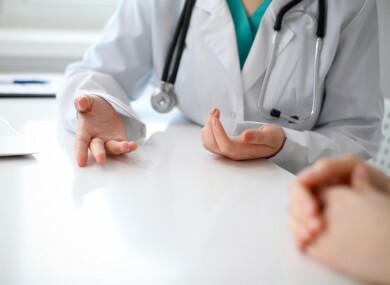 THE MEDICAL COUNCIL referred 23 doctors to supports for substance abuse issues last year, according to its annual report. The council’s health committee, which supports doctors with relevant medical disabilities and those who have committed to undergo medical treatment, saw 51 doctors last year. It also provides help for doctors who wish to continue to practice during their illness. The most common reason for attending was for a mental disability, with 26 doctors attending. The majority of these were referred to committee by the Medical Council, but 14 were self referrals. Complaints made against doctors increased by 19% last year, finds the report. In 2015, 369 complaints were received by the council. The most common complaints were in relation to communication, and went up by 40% from 91 to 151 this year. A total of 48 complaints related to professional skills, while 37 complaints related to treating patients with dignity. There were 19 complaints about the refusal of treatment and three complaints were made in relation to personal relationships with patients. Alcohol and drug abuse accounted for four of the complaints made against doctors. Each complaint is investigated by the Preliminary Proceedings Committee (PPC), which referred 60 cases for a fitness to practise inquiry. Three complaints were referred to another body or authority and 14 doctors were referred for a performance assessment of their practice. In total, there were 35 fitness to practice inquiries held by the Medical Council in 2015, up from 19 in 2014. Five doctors were struck off the register by the council last year, in comparison to just one the previous year. The report also finds that 2015 had the highest-ever number of doctors registered with the Medical Council. This year’s annual report shows there were 20,473 doctors registered. The workforce is still male-dominated, with 59% male and 41% female. Medical Council CEO Bill Prasifka said there have been more Irish female graduates entering the medical profession than their male counterparts. The majority of those on the register between the ages of 30 – 44 are female; however from 44 years and on the number of females on the register begins to decrease. Data from our Your Training Counts report also found that 40% of female trainees – or tomorrow’s specialists – want to work less than full-time and this definitely poses some questions for the health sector and all of those involved in the future planning of Ireland’s healthcare service. Email “Substance abuse: More than 20 doctors referred for help”. Feedback on “Substance abuse: More than 20 doctors referred for help”.